Read encouraging stories from our offices around the globe. 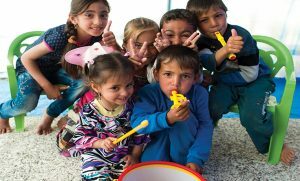 Thanks to your support, Samaritan’s Purse is able to provide spiritual and physical aid to hurting people in more than 130 countries across the globe. From our headquarters in the United States, and affiliate offices in Canada, the United Kingdom, and Australia, our mission is to meet the needs of victims of war, poverty, natural disasters, disease and famine with the purpose of sharing God’s love through His Son, Jesus Christ. An Operation Christmas Child shoebox distribution in a hard-to-reach community of Peru leads to a church plant and many children and families hearing the Good News of Jesus Christ for the first time. Australia: Please pray for Simran and her family, that they will mature in the Lord and continue to share their faith with family and friends making an impact within the Fijian Hindu community. Canada: For a record offering of Operation Christmas Child shoeboxes, and for the safety of all our supporters and volunteers as they deliver shoeboxes to our processing centers. UK: Please join with us in praying for the team of UK volunteers as they seek to locate spaces to set up and manage the processing centers for the 2016 Operation Christmas Child season. USA: Pray for the people of Haiti and the United States as they recover from the devastation of Hurricane Matthew. Simran, 7-year-old from an Indian Hindu family, loved her shoebox gifts – especially the coloured pencils and colouring books. 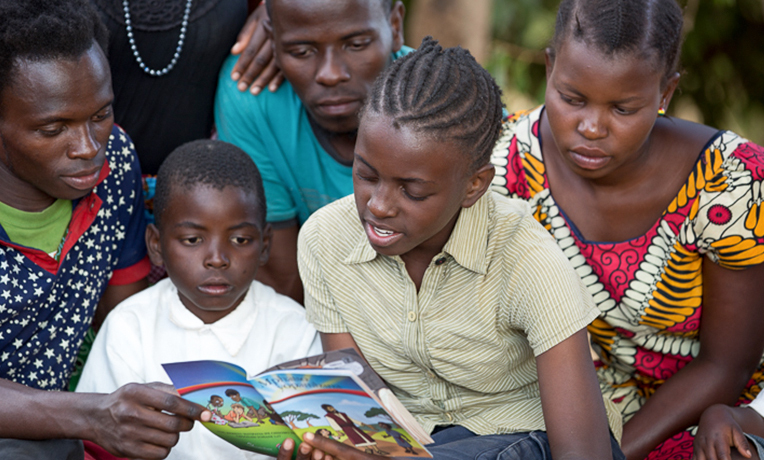 After receiving her shoebox, she joined The Greatest Journey class in her community. 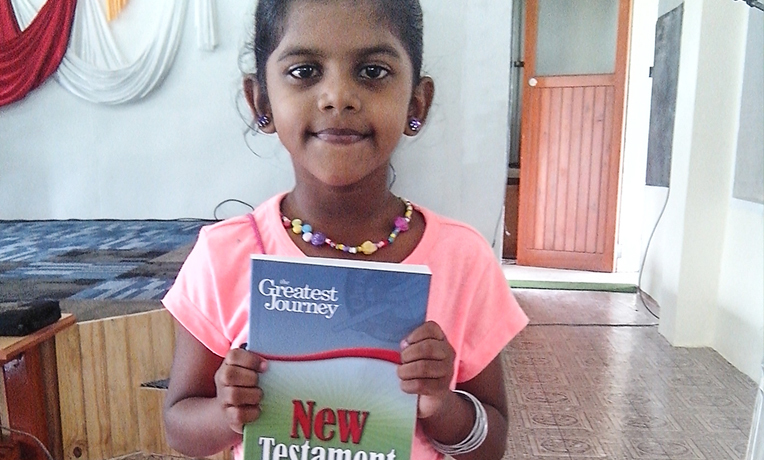 She wanted to know more about the creation and love of God because of the stories she had heard from church kids during the distribution. During the follow-up program, Samaritan’s Purse Australia had an opportunity to share the Gospel with and pray for them. As Simran’s life was transformed, she had so much joy to share with the other children on Sunday that her parents also started attending church. Three weeks after Simran received the shoebox, her parents became Christians. 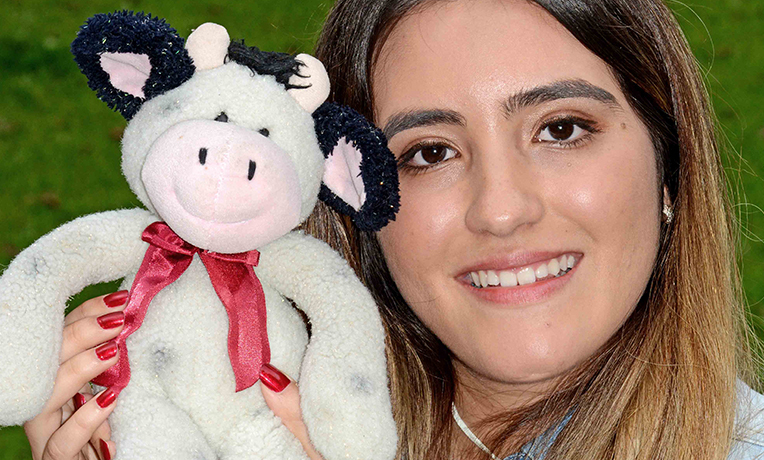 A cute little stuffed cow named Lula was the most cherished gift that 4-year-old Maria Fernanda Garcia found inside the Operation Christmas Child shoebox she received in Costa Rica in 1998. Maria, now 21, recently accompanied a group of Canadian volunteers as translator and saw the familiar red-and-green Operation Christmas Child shoeboxes. A long-forgotten memory stirred. At the time she received her shoebox, Maria’s parents were leaning heavily on their Christian faith. Her father had been unemployed for four years, and the family had no money for gifts. Her parents’ situation has improved dramatically since then and Maria, seeing first-hand how their faith in God helped them through hard times, made her own decision for Christ and was baptized at age 12. Vika received a shoebox gift while living in an orphanage in Ukraine as a child, and now she packs shoeboxes to send to other children. “I still remember that feeling of excitement and hope I had when we received our shoeboxes. “When the teachers gathered us together in our classroom and told us about the gifts we were super excited. I remember that my shoebox had everything purple! I got a little doll, little notebook, toothpaste/toothbrush, soap, colouring book, a letter and a picture of a family. I also received chopsticks, hairbands, hairbrush, pencils, pen candy and a little soft bear. It was awesome. “Now it’s been almost 7 years since I started making shoeboxes to send to other children all over the world. I’ve been receiving emails and pictures from a 12-year-old girl in Uganda who got my shoebox last year. On December 26, 2014, something unexpected and wonderful happened to the Kulemba family of Malawi. That day their 12-year-old daughter Angella received an Operation Christmas Child shoebox gift from the local church. The pens, pencils, eraser, notebook, and ruler she received blessed her Muslim family. Angella needed these items for school, but her parents could not afford them. “It was a great relief to the family,” said Angella’s mother Dorothy. The flashlight inside the girl’s box also meant a lot, but it was only a shadow of the Light they received from The Greatest Gift.  Whether it’s providing emergency shelters for victims of a natural disaster in the UK or abroad, clean water for a family in Africa, care and training to lift a family out of crippling poverty, or practical care for new mothers, a gift to Samaritan's Purse is a gift that will have a big difference in the lives of the people with whom we work.